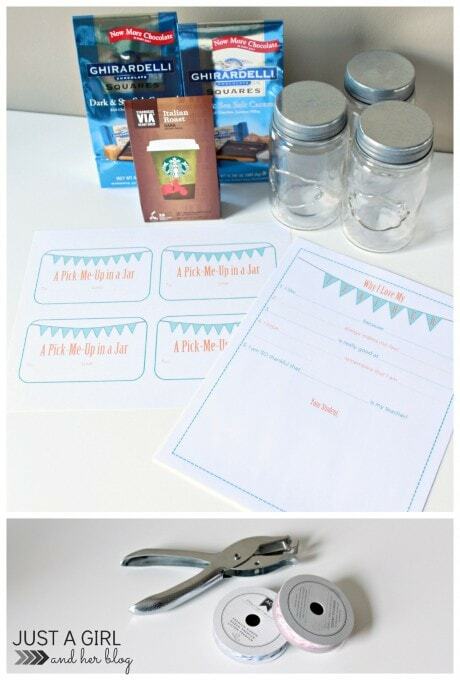 I am so excited to be participating in the Craft Lightning Teacher Appreciation challenge today with Country Chic Cottage and 30 Minute Crafts! These lovely ladies challenged us to create a sweet teacher appreciation gift that can be made in under 15 minutes. 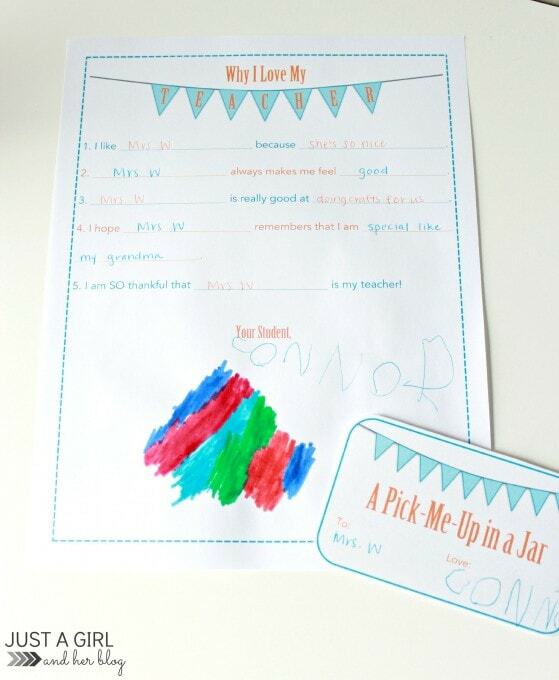 I always love seeing cute gifts in a mason jar, so I came up with one of my own, and I’m giving you all the printables you need to make one for your kids’ teachers too! I printed it out, asked him the questions, and filled in his answers. Then I had him sign it and make a little doodle at the bottom of each one. While he was doodling, I printed out some tags I had whipped up, cut them out, and had him sign those too. Oh and you can have the tags, too, if you’d like! Simple, cute, and even personalized! Not too bad for a 15 minute craft! Have you made any quick and simple crafts lately? 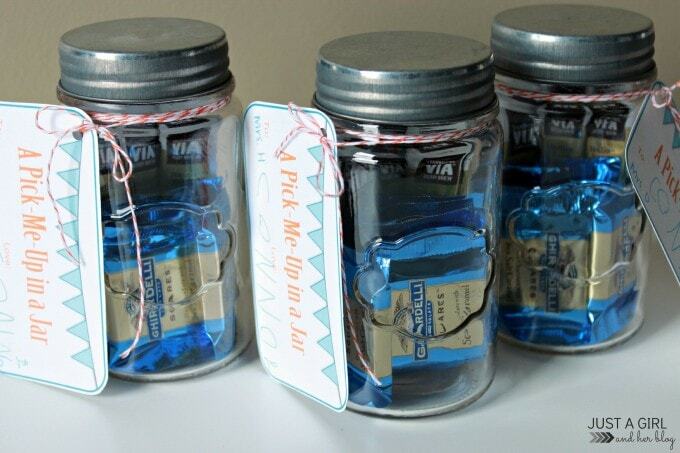 What a great gift in a jar! Thank you, Angie! And thanks so much for organizing– it has been fun! 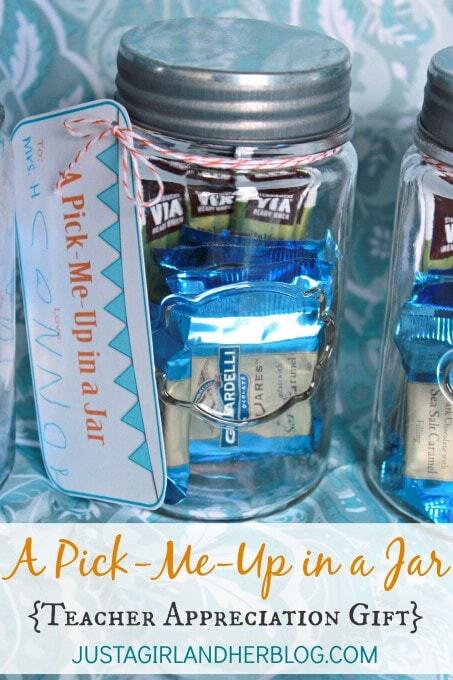 Hi there what a fantastic idea for a pick me up in a jar. I love those jars, did you get them recently? Hope so, I want some, little different look, so cute. You picked some great things to put in your jar. 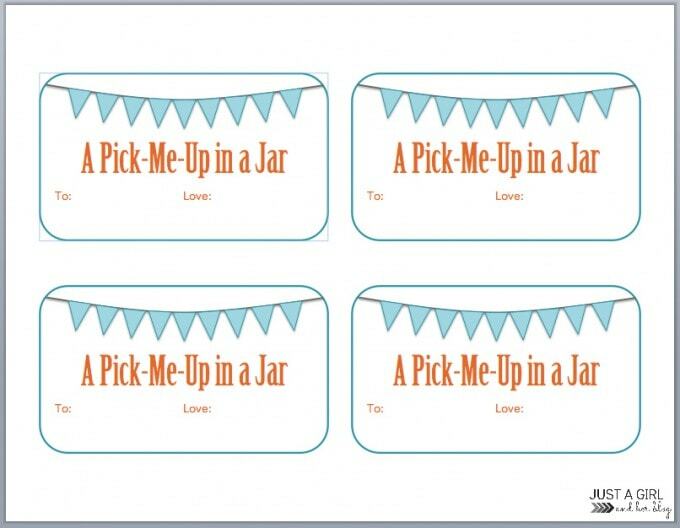 Thanks so much for free printables to make our own. You are, as always, a super duper blogger person. Yes! I got them at the Target Dollar Spot recently, so hopefully they still have them! Thanks so much for the Dollar Tree tip– I’ll have to go check them out! Have a great weekend! Oooh I love that idea! I know I need a pick-me-up sometimes too! Thanks so much for organizing such a fun tour, Carolina! Have a wonderful week! Certainement! C’est mon plaisir! (Certainly, it’s my pleasure). 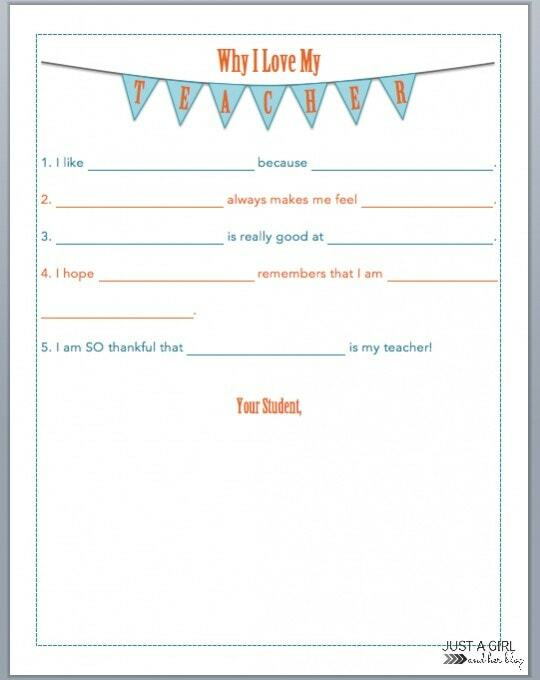 This is one of the best Teacher Appreciation gifts that I have seen. We love supplies, tea, chocolate, and coffee! Awwwww, thank you, Jennifer! You are the sweetest! I’m glad it is “teacher approved”! Have a great week!